A mystery writer and his sweetheart are held hostage by a fugitive gangster, who hopes to get writer's help in devising the "perfect crime"
The assistant (Arthur) of a sleazy lawyer (Holt) is determined to end his cheating ways. This would be a routine murder mystery if not for the plentiful number of suspects, and the fact that it takes place in a night club with a prison motif! waiters dressed as prison guards, a tough-talking emcee and the guests are seated in cells with prison bars. Of the plot itself, everyone onscreen has a motive to kill the nasty shrew Gail Preston, played by Rita Hayworth. 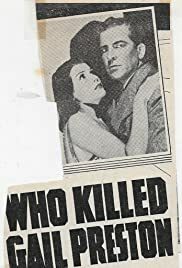 To no one's surprise, she is murdered early on and the bulk of the film deals with the detective and his dim-witted assistant trying to solve the mystery. Good job by all concerned and the murder is genuinely baffling, but to recreate the night of the murder, with all guests and staff members of the club assembled defies belief. In any case, you will be hard-pressed to figure out the guilty party. Most of the songs are long-forgotten but one, "Twelve O'clock And All's Not Well" is tuneful and may have gotten some mileage in the late 30's. And it is not Hayworth's voice - she was dubbed. Shown at Capitolfest, Rome, NY, 8/18. 6/10 - Website no longer prints my star ratings.